Semi-precious gems are said to have healing properties. Below is a list of the semi-precious jewellery available from Silver Wire Designs with the properties they are said to have. Generally it is thought that the best way to choose a gem or crystal is to pick out the one that you are drawn to that is the first one that catches your eye or stands out. See our healing bracelet for a nice gemstone mix or our Fertility Necklace. If you are purchasing from this website and would like us to include a few lines about the gemstone you have purchased please let us know. If you would like your item sent with healing Reiki wishes please ask. 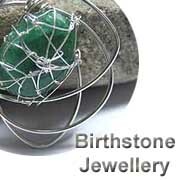 Visit our gemstone shopping directory for a full list of gemstone jewellery available. Silver is thought to be a Yin metal that is feminine and gentle. Associated with the moon and thought to be excellent for emotional and mental cleansing it is often useful as an aid in public speaking and helps us to see ourselves as others see us. Calming and emotionally balancing Silver is the metal associated with communication and is said to replace negative with positive. Agate - Truth - good for grounding and balancing and encouraging forgiveness. Agate is a stone with protective qualities and is very calming. Supposed also to alleviate stress and make you aware of your natural creative talents. It is also thought to help with accuracy in your work. It is particularly helpful to relieve feelings of bitterness and resentment restoring harmony to relationships. It grounds emotions and reduces feelings of envy whilst improving self confidence. Agate also helps with gum and teeth problems. Amazonite - Hope - improves self worth and promotes confidence. The gemstone of communication, integrity and trust it calms ones emotions and moods and soothes nerves. Amazonite enhances creativity and gives one hope. It boosts the immune system by helping blood flow and circulation. On the mental level, it is very relaxing, balancing and calming the mind, helping to alleviate stress and builds self esteem. Good for colic, heart problems, calcium deficiency, eczema, muscle problems including cramp and decreasing tooth decay and osteoporosis. Amber - helps one to manifest ones desires and gives a clarity of thought and wisdom to the wearer. It is also used as a protective shield against negativity and draws love, balance and calmness to the wearer. As a healing stone is thought to help with stomach, spleen, liver, gall bladder and kidney complaints, and nervousness as well as headaches and ear problems. It is supposed to give the wearer a positive disposition and help their creativity. Amethyst - Spirituality and contentment - boosts intellectual energy, inspiration and creativity. Reducing tension on any level, amethyst is excellent in the cure and prevention of headaches and migraine. Amethyst can help you to make a shift if you feel stuck on any level physical, emotional, mental, and intellectual or your spiritual state of consciousness. It will help you to clarify the goals in your life Amethyst guards against excess. Considered the stone of meditation it has a beneficial protective energy and imparts a calming influence. It is useful in helping one give up alcohol or any other excessive behaviour. Amethyst is used in the treatment of arthritis and insomnia and in protecting the body from toxic substances. It is used in many religious ceremonies to heighten spiritual connection whilst providing protection from negativity. Amethyst dissolves any anger and negativity one is feeling. Apatite - thought to be the stone of weight loss as supposed to aid in decreasing appetite by helping one to see the inner reasons for overeating. It is also thought to help balance the Chakras help in healing bones by aiding the absorption of calcium. Aquamarine - Courage - is a stone of courage dispelling fear and negativity, dissolving phobias, helping decision making and reasoning. It is calming and relaxing, helping you to be more balanced and centred. This stone of courage can be wonderful for you if you are studying for exams as it helps to calm nerves and remove fear. Aquamarine has a very gentle energy, which helps to bring compassion, moderation, tolerance and responsibility into your life. It boosts intellect and learning. Physically, Aquamarine will help with fluid retention, swollen glands, sore throat, eye disorders especially conjunctivitis, the stomach, joints and joint pain, kidney disorder, the lymphatic system and blood cleansing, fevers, jaundice and other liver disorders, balancing the thyroid gland and an overactive nervous system. It can be especially helpful in the treatment of neuralgia. Aquamarine makes life flow better and improves expression. Its calming energies quieten the mind and reduce stress. It is a stone with an affinity with sensitive people and gives support to those overwhelmed by responsibility. It can break the cycle of old self-defeating programmes and a great stone for closure. It clears blocked communication and encourages self expression. Aquamarine is helpful in understanding underlying emotional states and interpreting them. Bloodstone - Courage - Bloodstone is referred to in Greek as heliotrope which means Sun turning - this relates to a new happiness in the wearers life - the Sun shining its positivity on the wearer. Touching the stone was thought to prevent haemorrhage and blood loss. This stone fights and protects against jealousy and protects against negativity. It calms when anxious and improves physical strength so useful for athletes. This gem helps to enhance self esteem and appreciation of oneself. Good especially for those with anaemia. It is excellent for those with menstrual and menopausal symptoms as it enhances blood flow for the wearer and helps with irritability and impatient behaviour. Even nowadays it is used in India as an aphrodisiac. Bloodstone is a powerful amulet. Chalcedony - Benevolence and brotherhood - is a nurturing calming stone which absorbs and dissipates negative energy around the wearer. It brings the mind, body and spirit into harmony bringing a feeling of joy and encourages emotional honesty. Blue Chalcedony in particular is a creative stone which opens the mind to assimilate new ideas and helps in the acceptance of new situations and helps when learning new languages. It imparts mental flexibility and verbal dexterity and improves memory. It brings a feeling of light-heartedness and helps the wearer look forward with a new optimism. Blue Chalcedony also reduces oedema, stimulates the lymph glands is anti -inflammatory and lowers blood pressure and useful for those with Glaucoma it helps get rid of bad dreams. Helps with eye problems, gall bladder, spleen blood circulation and lactation. It is often thought to encourage kindness, and friendly behaviour and it helps absorb negativity and is useful if you lack stamina. Chalcedony is often used as a strong stone for protection against evil and helps reduce bad dreams by getting rid of the causes. Charoite - Transformation - a rare gemstone the stone which brings a new spiritual change to the wearer by balancing the crown chakra and allowing a new perception. Also healing to those who have given up drinking, for insomnia and for general healing also gives energy when exhausted. It releases fear and anger changing the emotions into positive ones. It helps speed up all types of healing, reduces headaches and cramps, also useful for heart problems and over use of alcohol. Chrysocolla - Perfection - helps to accept situations bringing an inner calm and stability releasing feelings of guilt and giving strength and renewed confidence to the wearer. It is also thought to attract true love to the wearer. Citrine - Abundance and Joy - a cleansing gem that attracts abundance and happiness. It helps in depression and also encourages a greater feeling of self worth so particularly useful during a relationship break up. Helps with constipation and balances hormones. Emerald - Integrity - is known as the gem that promotes success in love. It is also said to encourage patience. Good for friendships and creates a balance in mind body and spirit. Also thought to help with people suffering from Claustrophobia and memory loss. a stone that encourages one to live life to the full. Emeralds are beneficial for sinus problems, rheumatism and diabetes and aid recovery after infection. The green rays of the Emerald are thought to assist in healing malignant conditions. They give the wearer a strength to overcome the misfortunes of life and by healing the negative emotions enable to wearer to enjoy life to its fullest. Fluorite comes from the Latin word to flow and is said to increase your intuition and awareness, help you to concentrate and make decisions on a less emotional basis. Supposed to help alleviate depression, disruptive behaviour and help team work. Good for colds, headaches, and insomnia. Garnet - Commitment and Faith - is said to strengthen purify and regenerates bodily systems, especially the bloodstream. Stimulates pituitary gland. Aligns subtle bodies. Love, compassion, enhanced imagination. It is believed that if a garnet is put under a pillow it will cure depression. Garnets can be used to make a person popular and have self-esteem when worn as jewellery. It helps protect one on trips. Garnet is seen as a gemstone of increasing commitment - loyalty, devotion and faith. Garnets bring constancy to friendships. Garnets are also known for stimulating success in business. They repel negativity, gives courage and confidence as well as enhance imagination. Hematite - Mind - helps to de stress, calm and ground oneself and its magnetic qualities are also thought to help also with back pain. This gemstone is also helpful for those involved in public speaking to help them remain calm. Jade - Luck and Self Sufficiency - strengthens heart, kidneys and the immune system and helps cleanse the blood. Increases longevity and fertility. Aids eye disorders and female problems. Powerful emotional balancer. Radiates divine unconditional love. Clarity, modesty, courage, justice, wisdom. Peaceful and nurturing. Dispels negativity. The stone of longevity, offers healing of the body and spirit, used to maintain a healthy lifestyle. Jade represents gentle purification it is used in feng shui for its balancing and protective qualities. It is a peaceful protector of loving energy with the ability to create a centred harmonious peaceful confident feeling within. Jade helps to rid one of their self-imposed limitations and helps to achieve ones desires and goals so useful for example for loosing weight or other goals. Brecciated Jasper - Helps organizational abilities and brings a positive outlook on life and success in work. Leopard Skin Jasper - aids in service to others and thought to be a stone helpful in shamanic work, connecting and visualization. Reddy brown Jasper - a stone of justice enhances responsibility and compassion and a stabilizing stone and thought to be helpful for diabetes. Sea Sediment Jasper - many colours and useful for attaining inner peace. Kyanite - Attunement - thought to balance emotional, spiritual, intellectual and physical planes. It is used in adrenal, and genital disorders. It gives clarity of thinking and stimulates psychic abilities. Labradorite - Protection - forms a protective barrier to the wearer and helps to rid insecure thoughts particularly useful when going through a period of change as it helps to see problems more clearly. Thought to help with eye problems balancing hormones and stress. Labradorite is thought to be the gemstone that shows ones spiritual destiny often during dreams. It is a good stone for dieting as it regulates metabolism and a good to kick start an excercise regime. It helps one to focus so good for students and those with a lot of work to get through and for the creative types is inspirational by providing solutions to problems and giving new unique ideas. It helps with eyesight and warts. Lapiz Lazuli - Guardian Spirit - strengthens skeletal system. Activates thyroid gland. Releases tension and anxiety. Energizes Throat Chakra. Augments strength, vitality, virility. Facilitates opening of Chakras mental clarity, illumination. Enhances psychic abilities and communication with Higher Self and Spirit Guides. Associated with the Third Eye and Throat Chakras. It enhances sixth sense abilities of gaining secret knowledge. Facilitates visualization of wearer and healing properties and improves communication. Brings harmony in friendships and helps the wearer feel able to state their opinions openly. It brings mental clarity and emotional healing. Malachite - Vision - aids functions of pancreas and spleen. Reduces stress and tension. Aids tissue regeneration. Strengthens heart, circulatory system, pineal and pituitary glands. Aids sleep. Vitalizing for body and mind. Excellent balancer on all levels. Associated with Heart and Solar plexus Chakras. Assists in healing of emotions, brings peaceful sleep, brings extra power when used for divination purposes especially those pertaining to receiving one's hearts desire. Helps reduce feelings of guilt and clear the past. It can help in gaining insight into the cause of specific conditions such as relationships, resentments and anxiety so that you can release them. Also said to help with vertigo and a protective stone for those flying as thought to protect the wearer from accidents. It is also a stone of abundance and the stone of fidelity in love and friendships. Excellent for meditation and good for helping to remember dreams. Moonstone - New Beginnings and self actualization - is said to be a feminine stone and in harmony with the waxing and waning of the moon, promotes intuition and can enhance psychic abilities, opens the mind to higher levels of spirituality, balances stress especially hormone related disorders, pmt, conception, regulating the menstrual cycle and childbirth. In old Eastern cultures, Moonstone was believed to attract new love to you. Mother of Pearl - helps to make clear and sensitive but focused decisions. Onyx- Old Memories and Power - helps in times of difficulty to keep a centred approach to situations and to analyse old memories to move forward with a more confident strength without fear and with a new confidence. It helps one with major challenges by grounding and and eliminating unwanted negative energies around the wearer. Also helpful for childbirth and in the healing of wounds and increases stamina and self control. It is thought to be a stone of power proteting the wearer from negativity as the black is thought to create an invisibility cloak around the wearer. Therefore a useful gem in times of conflict. Opal enhances self worth encourages your artistic self and said to attract loyalty in others. Also thought to be useful in the treatment of Parkinsons disease, in regulating insulin and for those suffering PMS and infections. Opal is thought to be a gemstone of seduction releasing inhibitions and intensifying ones emotions and is helpful for eyesight issues. Pink Opal is a stone of love and gentleness associated with the heart chakra it encouraging kindness in romantic relationships and inspires the wearer to be more creative by releasing inhibitions and encouraging imaginative behaviour. Opalite - Communication - Although technically a glass but treated with similar treatments as gemstones it is said to also be useful for communication and meditation thought to help with fatigue and moodiness and brings success in business. Also thought to help clean the blood and kidneys. Pearl - Sincerity - reduces over sensitivity, peaceful. Symbolize charity, honesty, wisdom and integrity, all the best within us. Can stimulate femininity and help with self acceptance. They lift your spirits and make you feel calm and beautiful. They remind us to walk with dignity. Pearls not only provide a mirror in which to see ourselves, but give us insight into how we appear to others. Peridot - Protection and Guidance - has a friendly energy and draws to the wearer abundance and prosperity whilst also encouraging patience and harmony in relationships. It increases happiness and well being by releasing guilt and stress and helps one to leave the past behind. It balances the glandular system. Peridot increases intuitive awareness which accelerates personal growth and opens new doors of opportunity to the wearer. Peridot can help one find what s lost and is said to protect the wearer with a strong protecive shield. Aids tissue regeneration so thought to slow down the aging process it has a beneficial influence on heart, pancreas, spleen, liver, ulcers and generally purifies the body. Helps overcome obsessive behaviour and jealously thus enhancing an inner confidence allowing the wearer to move forward take responsibility for their life and find their true path. Rhodochrosite - Love and Balance - A strong stone for emotional healing connected to the heart chakra - it is used to shrink cancers and help one to come to terms with grief. Rhodochrosite is a gemstone that reminds you of how lovely you are helps you to share feelings whilst feeling safe. Rhodonite - Brotherhood and Love - used to stabilize emotions, sort out scattered feelings and helps create a more balanced attitude. Balances the heart chakra and can calm inner turmoil, induces self love. As a healing stone, it is a speedy wound healer especially useful for those in shock and can aid arthritis, ulcers, and fertility problems. Rose Quartz - Power and Love - this is a comforting and gentle stone - the stone of unconditional love it is the most important stone for the heart chakra and brings deep inner healing and self-love. It is calming and reassuring and considered to be the best emotional healer releasing emotions and soothing internalized pain. Rose Quartz comforts one in times of grief and encourages self-love and self-forgiveness and acceptance on all levels. In relationships it helps to restore trust and encourages unconditional love. It is a great gift to give a friend as a symbol of friendship or appreciation. It aids kidneys and circulatory system and increases fertility. Rose Quartz also eases sexual and emotional imbalances, helps clear stored anger, resentment, guilt, fear and jealousy. It reduces stress and tension and cools a hot temper and enhances self-confidence and creativity. Sometimes known as "The Love Stone" it is also thought to attract love. Ruby - Passion and Energy - is a gem that energizes and induces an optimism for life. It helps one concentrate. Ruby can take negative emotions and change them into positive. Thought to be useful when exhausted it also helps one become motivated. The Ruby is thought to be a protective stone which brings and increases romantic love to the wearer. Protective both on a physical and psychic level it promotes healing on all levels and banishes fear of the paranormal and evil. It is also useful for driving away bad dreams and helpful in calming hyperactivity. It is thought that Ruby stimulates the kundalini energy within the stone of passion so thought to be an aphrodisiac and helpful in conception. Sapphire - Wisdom - is known as the stone of wisdom alleviates depression and helps concentration. It is thought to attract gifts and help one to express themselves more freely. Sapphire treats blood disorders including excessive bleeding and heals eyes. Blue Sapphire is used to find ones spiritual path and to speak your truth. It is believed to give the wearer everything that he or she desires - health, wealth, longevity and happiness. This gem also restores lost wealth and property, counteracts the envy of enemies and removes the evil eye, protects one from dangers and mental unrest and alleviates long-term misfortune. It is also believed to improve fertility in women and to shrink cancerous tumours. Snowflake Obsidian - Balance - is thought to be a calming gem and helpful in bringing unhealthy behavioural patterns to light aiding in the release of negative thinking patterns so helping to prevent feelings of isolation. It helps one to see the patterns in their life and enables them to re-assess and change them in a gentle way. Also thought to benefit circulation for veins and smooth skin. It acts as a protective stone against physical and emotional harm. Sodalite - Harmony - It absorbs and neutralizes disharmony and unburdens your thoughts. It neutralizes negative thoughts and emotions directed at you by others. It helps to unite common sense with intuition, often used to aid meditation and also can be used to clear electromagnetic pollution. This stone can bring emotional balance, lowers blood pressure and can help balance metabolism. Thought to stimulate the third eye helping to open a spiritual understanding of who you are and a path to find your inner truth. Useful also for people who experience panic attacks, phobias and irrational fears in bringing a sense of calmness and self confidence to allow new ways of thinking. Tanzanite - Magic - thought to help in the absorption of Zinc and ease blood pressure as well as generally encouraging more positive thoughts and behaviours. It is also thought to help one connect with their spirit guides. Tigers Eye - Humanity - enhances psychic abilities and encourages use its use in a responsible manner. 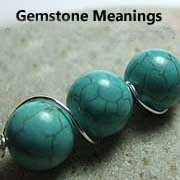 Worn as a protective gem it also helps to ground thoughts and so help in decision making and overcoming conflict. Helps also to lift depression and encourage a more positive mental attitude. Stimulates a more positive self image and thought to help with the healing of broken bones. Topaz - Good fortune and Love - known as the stone of strength and the Sanskrit word meaning fire they are used for clarity of mind and focussing thoughts they are also thought to reduce mood swings and lessen worries and help reduce insomnia. A joyful gem Topaz brings abundance and good health, success in your endeavours and good fortune. It also brings a clarity to your thoughts and helps to solve problems. It allows you to recognize what you have achieved through your life experiences. Also aids digestive problems, eating disorders and nervous conditions. Tourmaline - Shaman - aids Balance of endocrine system. Aids sleep. Strengthens, vitalizes, body/mind. Activates and enhances crystalline properties of body/mind. Aligns subtle bodies. Dispels fear and negative conditions. Strong protective influence. Enhances sensitivity and understanding. A powerful healer Tourmaline is highly electromagnetic Protective, guards against bad vibes. Integrates and harmonizes left and right brain activity which enhances the person's psychic and medium ship abilities. Aids in balancing the whole person and the psyche. Tourmaline has been thought to be one of the most protective stones protecting the wearer from evil around them. If tourmaline is buried in the earth it is also thought to encourage the healthy growing of plants near it. It is also thought to strengthen the immune system. Turquoise - Master healer - a protective stone which can dispel negative energy, balances the throat chakra and can help you find your voice if something needs to be said also used as an aid in problem solving. As a healing stone it alleviates tiredness, depression and panic attacks. Turquoise is said to help you find your true path in life and especially useful in creative endeavours as it helps to link your intuition with self expression. Unakite - is a gem to calm and balance it enhances spirituality and helps to overcome past issues by encouraging connections. Unakite helps balance relationships both personal and in business with its nurturing properties. Thought also to help with fertility problems and in pregnancy and childbirth particularly useful for both the male and female reproductive systems it is thought that placing some Unakite under a pillow will aid with conception. It helps with weight loss and the circulatory system as well as cutting down on smoking and other addictions. It removes toxins and cleanses emotions. It can also be used to negate electromagentic energies from TVs and oher electrical equipment. Vesuvianite - is the stone of loyalty and co-operation. It is thought to calm all negativity including external anger and internal depression to give more self confidence and positivity and helps to clear negative thoughts. Metaphysical and healing lore is for inspiration, reference and entertainment purposes only. See your doctor or other qualified healthcare practitioner about all injuries, illnesses or other health related issues. Mystical lore on crystal healing is not a prescription or diagnosis. It is meant as alternative and complementary and claims are not scientifically substatiated. By using thie site you acknowledge and agree that you personally assume responsibility for your use or misuse of this lore.